Farkel is a popular dice game that is easy and quick to play, with simple rules that rely on luck, but allow for significant elements of strategy and skill as well. The game is played by two or more players, using six six-sided dice. A dice cup is often used to hold and then toss the dice, though of course your hand may work just as well. The object of the game is to be the player with the highest score over 10,000 points. Players take turns rolling the dice. To begin a turn, a player rolls all six dice at once. Points are earned for various scoring combinations. If no points are scored during that roll, that's called a "Farkle" and you lose your turn, and score no points. If any points are scored during that roll, you have the option of either banking the points, and relinquishing your turn, or pressing your luck and rolling again, using the dice that were not scored during the preceding roll(s). You can keep rolling, and keep racking up points, until you either bank your points, or roll a Farkle and lose all the points from that round. If you manage to score all six dice (whether in one roll or multiple rolls), start the next roll with all six dice again. To get on the board for the first time, you must score at least 500 points on a single turn. (In other words, your first bank must be at least 500 points.) After that, you may bank as many or as few points as you like during a turn. Then the first player reaches a score of 10,000 points, each player has one last turn to try and come out on top. The player with the final score at the end of that last round wins the game! As you can see, each roll requires a decision – do you settle for what you have, or go for more points and risk losing them all? This element of strategy can make for a tense, but fun, game, and is one of the reasons that Farkle has remained a popular dice game for generations. FarkleRules.com has some sample score sheets that you can print out and use (albeit with slightly different score tables compared to the one above). Other names for Farkle include: 1000/5000/10000, Greed, Hot Dice, Wimpout, Squelch, Zilch, and Zonk (among others). 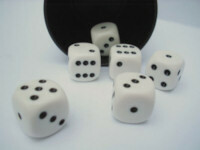 Farkle is also related to dice games such as Kismet and Yahtzee, which use some of the same gameplay elements and strategies. To learn more about the game of Farkle, consult one of the many fine web sites below, which provide additional rule and strategy guides. Provides the "definitive guide" to the dice game Farkle / Farkel, including various options, history, and current information. Dacy and Amy's Official Rules of Farkle, including a history of the game. Information about the game of Farkle, from the free online encyclopedia, with rules, variations, and probabilities.